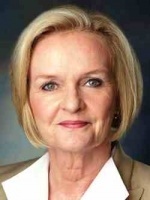 WASHINGTON, D.C. (Oct. 29, 2015) — U.S. Sen. Claire McCaskill today introduced bipartisan legislation that would provide new protections for financial institutions to report potentially exploitive or fraudulent activity to authorities when they notice unusual activity in the accounts of their clients over the age of 65. Under current law, some banks have expressed concern that they could be violating their clients’ privacy rights and therefore be susceptible to administrative or civil liability for sharing information. The Senior$afe Act, introduced by McCaskill and Republican Sen. Susan Collins of Maine, would provide immunity to banks, credit unions, broker-dealers and investment advisers who in good faith report potential incidences of exploitation of a senior to state or federal financial regulatory agencies, law enforcement agencies and/or a state’s adult protective services agency. To qualify for immunity, the financial professionals raising these red flags would be required to undergo training to identify potential financial exploitation. McCaskill and Collins lead the Special Committee on Aging, which promotes discussions and conducts investigations on areas of special interest to older Americans. A copy of the legislation is available online at THIS LINK.